For example, in California in 2016, Alameda County’s Community Commutes Day competition used an online game to encourage employees to bike, carpool, or use public transit. Municipal buildings competed as teams to earn the most points through clean commuting and program engagement. 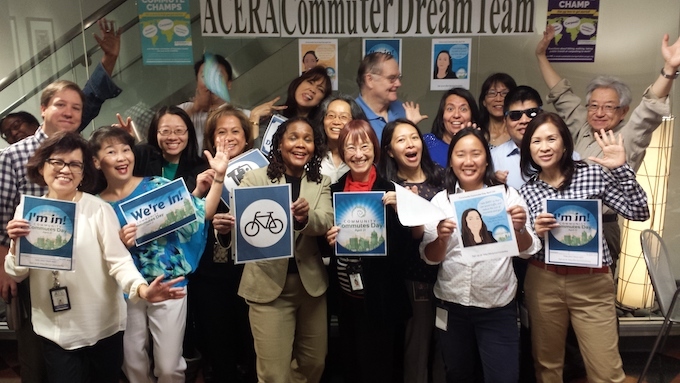 Photos of Community Commutes Day participants, courtesy of Alameda County. Our study finds that many cities joining We Are Still In or the Mayors Climate Alliance are using behavior change strategies and program designs as one way to help meet their Paris Agreement goals for reducing greenhouse gas emissions. New York City and Denver, for example, cite their climate action plans as a motivator for designing behavior change programs to save energy. Local governments cite additional motivations for their programs, such as community engagement, economic development, job creation, and energy affordability. About a third of the programs surveyed focus on serving low-income or underserved households and communities. Many cities and counties face challenges in developing and implementing their programs. For example, Virginia’s Arlington County struggled to expand the scope of its Green Games program, which initially targeted energy and water savings in the commercial building sector in October 2010 to 2011. While the original program proved successful because of extensive staff engagement and relationship building in that sector, the county faced barriers such as competing priorities and low participation while trying to expand to the retail, restaurant, multifamily, and hospitality sectors. Strong evaluations can help measure success and identify solutions to program challenges, but measuring success can be difficult. Even though independent third-party evaluations are key, the vast majority of cities and counties surveyed did not complete them. Many local governments track some performance metrics internally, but programs would benefit from more robust evaluations. Piloting and testing new ideas and concepts can also help determine solutions to program challenges. In the new report, we provide recommended steps for local governments to ensure effective programs, such as conducting preliminary research, piloting ideas, and comprehensively evaluating outcomes. By following these steps and learning from past examples, cities and counties can build on these behavior change strategies to design programs that achieve long-lasting energy savings tailored to meet the goals and needs of their communities.